Saturday March 23 from 1 – 4 pm. At America’s Stonehenge, Salem NH. 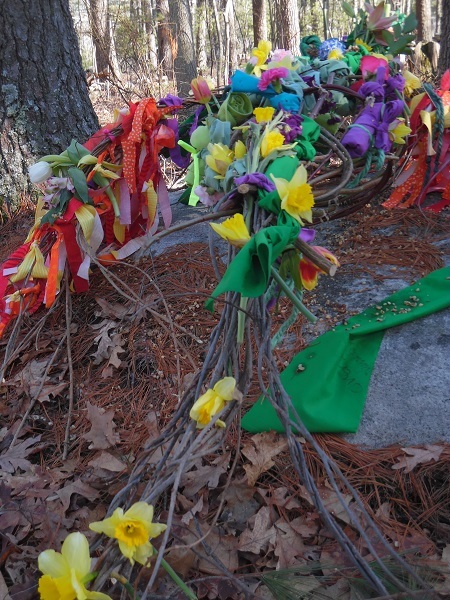 The Vernal Equinox this year provides a powerful gateway as it coincides with a full moon. The Equinox is a balance point between light and dark, yin and yang, spirit and matter, the abstract and the concrete. It announces the awakening of the earth as it begins to propel life forward in rapid succession assisting the growth and expansion to ultimately reach optimum dimensions at the solstice point. This is a vulnerable time for the young life as it faces the challenges of unpredictable weather patterns and potential late frosts. Ceremony is our way to midwife the birth of the new life and pray for the protection of the young life so that the sprout can make it to flower, fruit and seed and life can continue. We attune ourselves to the rhythm of nature and become aware of our impact on the life around us to make sure we do our part to protect the awakening life. We are in a time of major changes that affect us personally as well as globally. More and more people express concern about climate change, but changes are also experienced in our political and economic climate. The question arises how do we become resilient to handle these changes? We look at the indigenous ways that have been time tested throughout the ages. Following the cosmology of the Dagara people of West Africa we have entered now a mineral year. The wheel is universal as it reflects the energy patterns of what is surfacing right now. Mineral is the record keeper of the past and the storage house of the future. Mineral helps us remember and is connected to our divine purpose. Its conductivity makes it part of our communication system. Speech, thoughts, stories, memories, and creative ideas are part of the mineral realm. Mineral operates slowly and stands opposite of nature that transform rapidly. This year will have a very different feel to it than last year’s ongoing transformations, it may feel easier. Some key pieces we are here to remember is that we are one, who we truly are, and what we empower through our thoughts, words, feelings, and actions that makes us creators of our own reality. Also the deeper stories are emerging, the records are being released, the hidden is going to be made more and more visible as the new earth will not tolerate frequencies that are not vibrating at the level of the New Earth. This Equinox will accelerate our awakening and the awakening of humanity. For more info with the full description, preparations, and intention click here.